Kashmiri red chilies or simply the paprika are small, round and less pungent but provides a very vibrant red color to a dish. Kashmiri red chilies are selectively bred for color and flavor. No cholesterol, Very high in dietary fiber and High in potassium are the good points about this spice. But they also have sodium in a very high amount so over usage should be avoided. These chilies are best valued for their high color retention and hence known for adding taste and texture at the same time. It can be stored in the powdered form using an airtight jar to avoid the exposure to air and moisture. What are Kashmiri Chilli Called in Hindi, Marathi Gujarati, Tamil, Telugu and Other Indian Languages(Regional)? 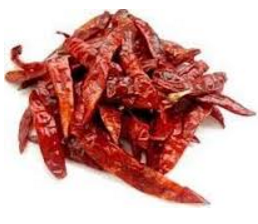 It is commonly known as Kashmiri mirch in Hindi, In gujarati they call it Kasmiri maracam, in Marathi they call it Kasmiri Mirchi, In kanada it is known as Kasmiri meṇasina, In Malayalm it is called as Kasmiri muḷak, in Telugu they call it Kasmiri mirci, In Tamil they call it Kasmiri miḷakāy. Known for its medicinal properties liquorice was used as a medicine traditionally rather than as a spice. The root is the main part of this plant for such purposes. As this part is a demulcent and soothing to mucous irritations, relaxant and valued mostly for its sweet taste and to avoid the sharpness / pungency/taste of other remedies by its own flavor. Ayurveda too mentions its various uses and suggests it as the best for the treatment of coughs, regular colds, and various bronchial irritations. The sugar of Liquorice can be consumed by diabetics too. What is Liquorice Called in Hindi, Marathi Gujarati, Tamil, Telugu and Other Indian Languages(Regional)? These Seeds are green colored when fresh and turn cream or yellow color when dried. 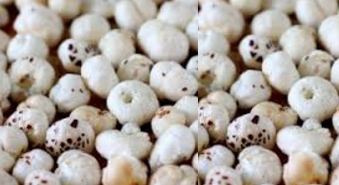 Lotus seeds can be consumed raw either in fresh or in dried form. The dried form is easily available in markets compared to the fresh Lotus seeds. The major nutrients which are present in lotus seeds are fats, proteins, some useful starches, iron, calcium, zinc, and magnesium. Considered as good medicine for heart problems these seeds also provide a refreshing and calming effect to your body. They are useful for detoxification of the spleen and also improve the appetite. What are Lotus seeds Called in Hindi, Marathi Gujarati, Tamil, Telugu and Other Indian Languages(Regional)? In english it is known as Lotus Seeds, in Hindi and marathi they commonly know it as Makkhane, in tamil it is called as Tammaraie Vitaikal, in telugu it is called as Tavara Vittalu and in kannada it is known as Tavare beeja. Sichuan Pepper is a most common spice which is widely used in Chinese and South East Asian Cuisines. The entire husk or the whole shell can be used for various purposes. When we start counting the benefits of this amazing herb the list is long. From stimulating the immune system and strengthening the bones to reducing the inflammation and improving the hemoglobin content the Sichuan works very well. The Sichuan pepper also helps for a healthy digestive system and the Potassium present in it works as a vasodilator and hence prevents blood clotting. What is Sichuan Pepper Called in Hindi, Marathi Gujarati, Tamil, Telugu and Other Indian Languages(Regional)? Dry Coconut is the best to substitute for fresh coconut and it makes your food tasty and also helps in the presentations. Its high nutritional value makes this favorite for healthy diets but if you want to lose weight then you should avoid it. It is a good source of Dietary fiber, Riboflavin, Iron, manganese and also Vitamin B6. It promotes healthy functioning of your Brian and at the same time, it strengthens the connective tissues of your body. Dry Coconut is highly recommended for anemic patients and adding Dry coconut to your daily diet is helpful to fulfill the requirements of some specific minerals. What is Dry Coconut Called in Hindi, Marathi Gujarati, Tamil, Telugu and Other Indian Languages(Regional)? In English it is known as Dry Coconut, in hindi, marathi and gujrati it is commonly known as Copra, in Tamil it is known as Ular tenkay, in Telugu they call it Endu Kobari and in kannada they call it Vona kobari. When you are looking for a natural Sweetening Agent with high nutritional values then jaggery is the most suitable option to be considered. Jaggery is considered as energy food due to high carbohydrate content which provides energy over an extended period of time and highly recommended for athletes. It helps with the digestion when consumed after a heavy meal. It is also considered as a cleansing agent as it helps effective cleaning of respiratory tracts, lungs, food pipe, stomach, and intestines. From fish bait to Animal feed this sweetener can be used for various purposes. It is a good source of Iron but the overconsumption of Jaggery can make you diabetic hence use it accordingly. 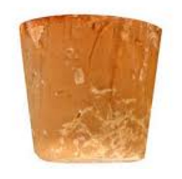 What is Jaggery Called in Hindi, Marathi Gujarati, Tamil, Telugu and Other Indian Languages(Regional)? In English it is called as Jaggery, in Hindi it is commonly called as Gura / Gur, In Tamil it is called as Vellam, in Malayalam it is called as Sharkkara / Vellam, in Telugu it is called as Bellam / Bellamu, in Kannada it is called as Bella, in Bengali it is called as Gur, in Gujarati it is called as Gol / Gur, in Konkani it is called as Godd, in Marathi it is called as Gul, in Oriya it is called as Guda, in Punjabi it is called as Gur and in Kashmiri it is called as Gor. Ripe Mangoes has very low shelf life hence from ancient times these are preserved stored in a very scientific manner. The dried mangoes are good options when the fresh ones are not available as they are packed with vitamin A. It helps in maintaining skin and mucous membranes supply and also provides invaluable support to both immune and ocular systems. Dried mangoes are also a good source of B-complex vitamins also assist in maintaining a healthy metabolism, a balanced mood, and a healthy cardiovascular function. The sugar content in these is very low when compared to the fresh ones and are also packed with digestive-enhancing dietary fiber and immune-boosting antioxidants. What is Dry Mango Called in Hindi, Marathi Gujarati, Tamil, Telugu and Other Indian Languages(Regional)? In english it is called as Dry Mango, in hindi and marathi it is called as Aamchoor, in Tamil it is known as Maangaa Podi, in gujarati it is known as sukhi keri, in telugu they call it Mamidikaya Pudi and in kannada it is known as Mavinakai Pudi. Muskmelon is a fruit which is only available in summers but the muskmelon seeds are easily available in any season. If don’t want to shop them then save the seeds and preserve them for your use. They are highly recommended for women, children and diabetic patients for sound health vitamin help prevent macular degeneration in the eyes. For Your Bones, One of the health benefits of muskmelon is that it helps improve bone density. These seeds are really beneficial for healthy heat as the omega-3 fatty acids present in muskmelon seeds play an important role in fighting cardiovascular diseases. For weight loss and digestive problems, the muskmelon seeds are perfect. What are Musk Melon Seeds Called in Hindi, Marathi Gujarati, Tamil, Telugu and Other Indian Languages(Regional)? In english it is known as Musk Melon Seeds, in Hindi it is commonly called as Kharbuja, In Tamil it is known as Mulampalam Vitaikal, in telugu they call it Kharbuja Ginjalu, in kannada they call it Kharbuja beeja. 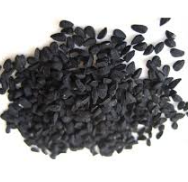 Nigella Sativa or simply Black cumin is the most important ingredient for Indian curries and various other dishes. It is not only consumed as a spice to add the aroma and flavor to Indian food but also as the home remedy for various health problems. Cumin is helpful for the patients of Epilepsy, Type 2 Diabetics and also for the colon cancer as the latest research in the medical field proves the improvement in specific cases. The extract from Nigella Sativa is highly recommended for patients with oral cancer and it also reduces the risk of Heart attacks. This is a must have Ingredient in Indian Kitchens and you should also add it to a healthy body. What is Nigella Sativa Called in Hindi, Marathi Gujarati, Tamil, Telugu and Other Indian Languages(Regional)? In English it is called as Nigella seed, in Tamil it is called as Karuppu yel, in Malayalam it is called as karinjirakam, in Telugu it is called as Nalla vittanalu, in Kannada it is called as Krishna jeerige, in Hindi it is commonly called as Kalonji and in Bengali it is called as kalo jira.